You are going to LOVE this baking soda science experiment!! Toddlers and preschoolers (and older kids too) that love rainbows will be AMAZED with this rainbow science experiment for kids. The best part is that it is pretty easy to setup for an afternoon of fun learning using just a few supplies!! 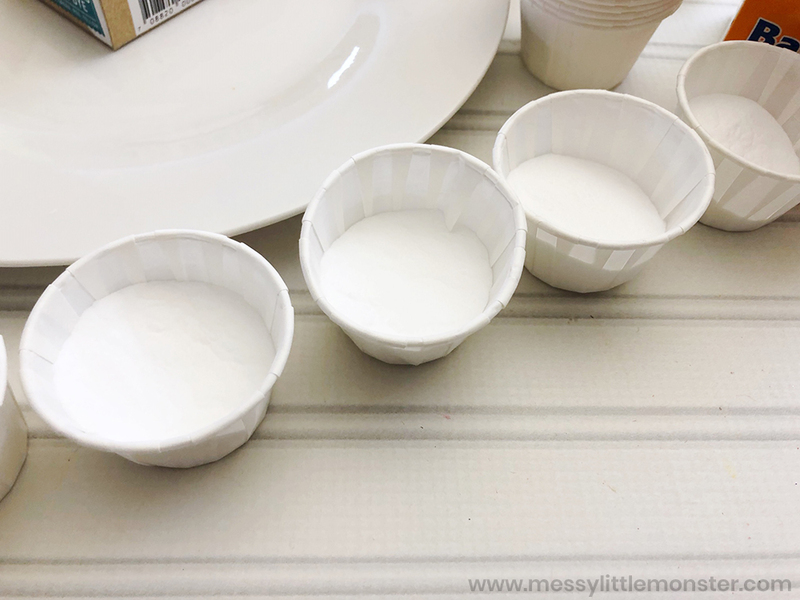 Below you will find step by step directions to get started with this fun and easy baking soda science experiment. colour changing flower science experiment. 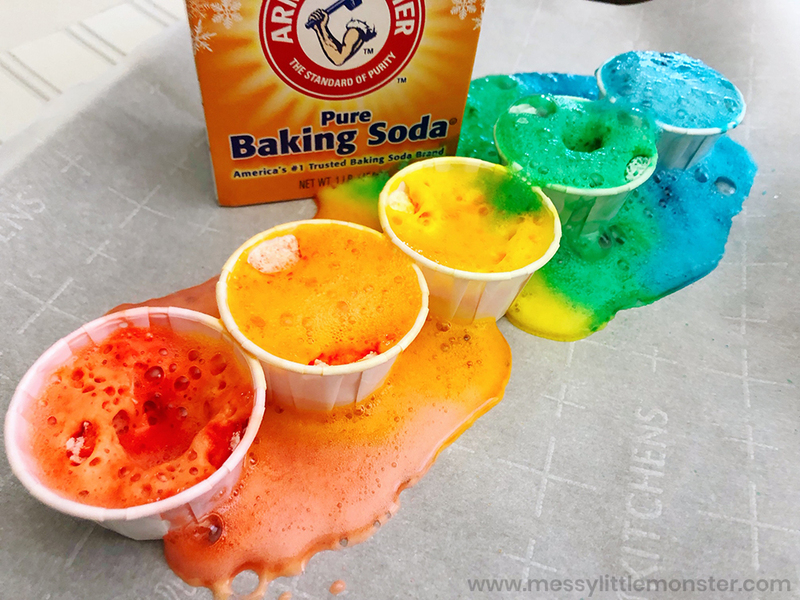 This baking soda science experiment is PERFECT for homeschool units, classrooms, messy playdates, or even just a fun afternoon at home! 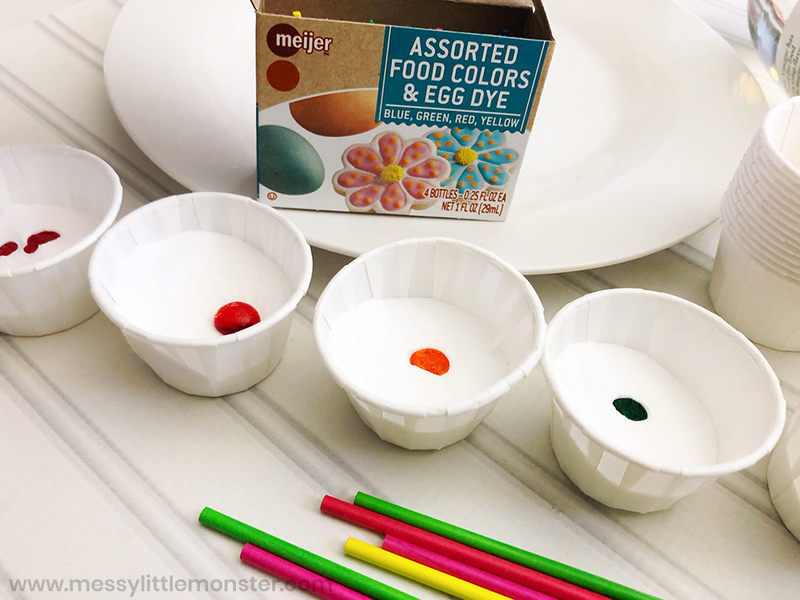 Children of all ages from toddlers and preschoolers upwards will LOVE this science experiment for kids. 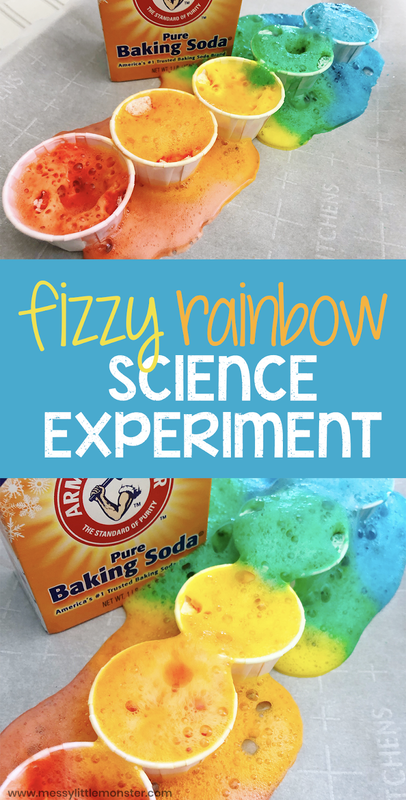 It is guaranteed to be LOTS of fun as the kids will be amazed at the fizzing colours in this rainbow science experiment. 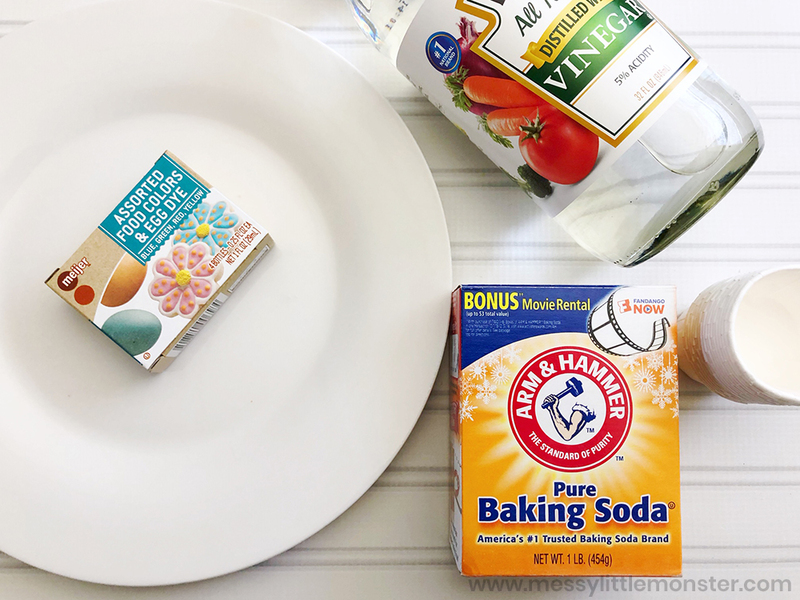 Scroll down below to get started with your baking soda science experiment. Before you get started, gather up all the supplies you need for this rainbow science experiment. 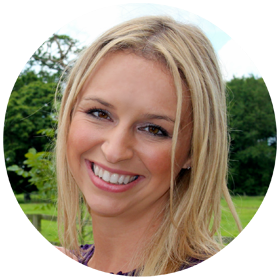 The kids will be so excited once you get started that you will want to have everything to hand! Fill each paper cup 3/4 of the way full with baking soda. Be sure to have enough for each colour you want to use! TIP: Before starting I would advise lining a tray with parchment paper to do this experiement on to minimize the mess! Next, add a few drops of food colouring in each cup. 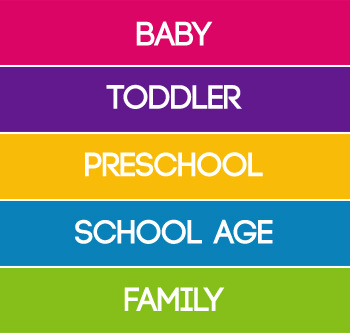 you will need to add a different colour to each cup to create a rainbow effect (see image below). 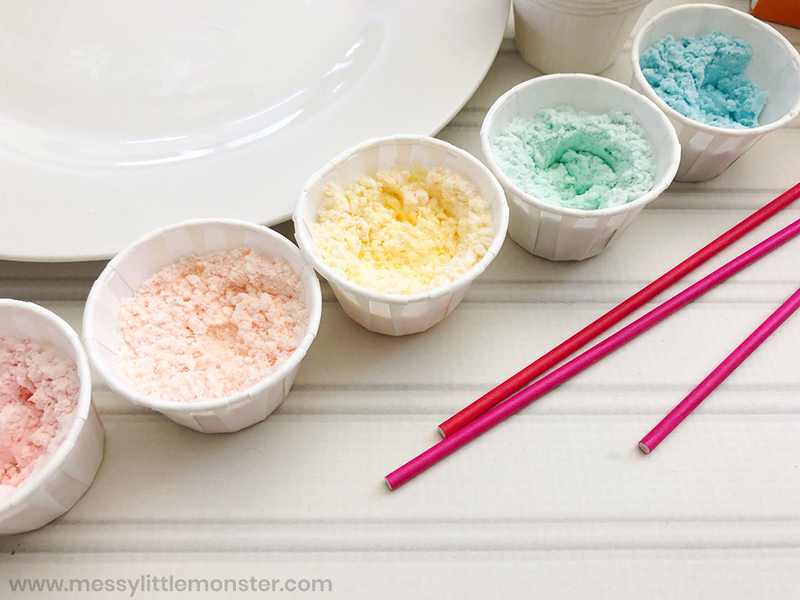 Mix each colour into the baking soda well until the colour has been well distributed as shown below and then line the cups up on your tray covered with parchment paper. Now for the fun part! Your baking soda science experiment is now set up and ready to go ! Pour vinegar into each cup and watch the colours erupt. 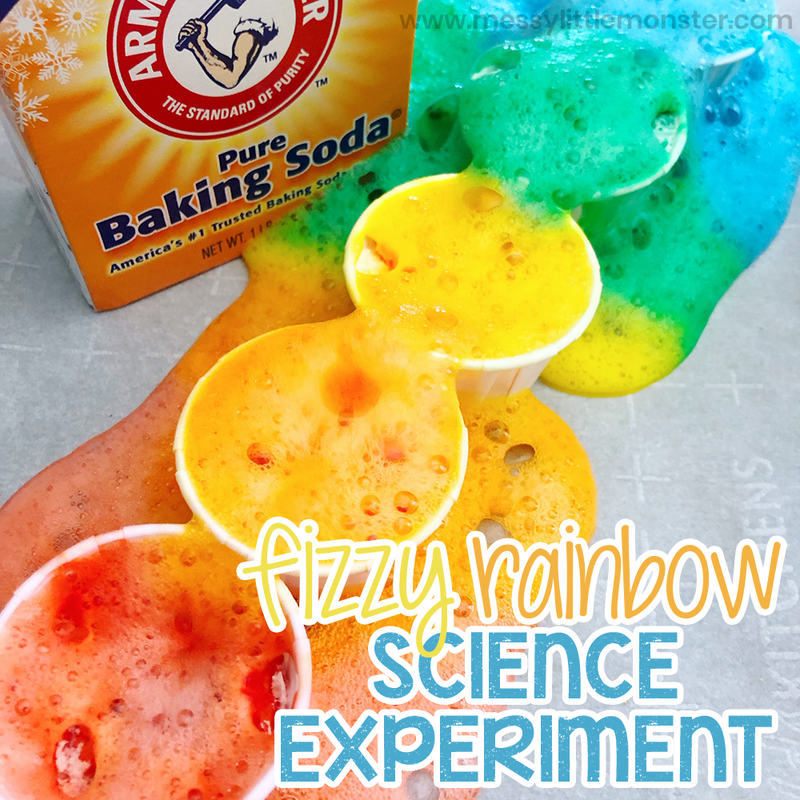 The baking soda and vinegar will react as they come into contact to create a fizzy rainbow eruption! The kids will be amazed as the watch the baking soda explode and they will want to do this easy science experiment again and again! We hope you enjoy trying this super fun baking soda science experiment!! Toddlers and preschoolers as well as the big kids are sure to LOVE watching the different colours erupt. Science experiments for kids are so much fun to do, they are a great learning experience for young children and they are in awe watching. This rainbow science experiment is sure to catch their attention!